A delicious rendition of surf & turf. 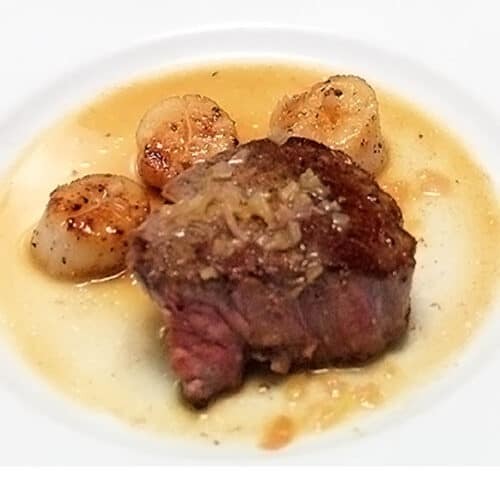 Perfectly cooked steak and scallops is brought to the gourmet level with an easy, anyone can make it, champagne butter sauce. And it's all made in one pan! Believe me, this dinner will make any occasion special! Season the fillets and scallops with salt & pepper. Let steaks sit out to warm, about 20 minutes. This will prevent the steak from having a cold center when done cooking. Heat 1-1/2 teaspoons oil in a large heavy skillet over medium-high heat. Add steak and cook about 3-6 minutes a side depending on thickness and your desired doneness. Remove from heat and keep warm. Add remaining oil to skillet and add scallops, making sure not to crowd them as they will steam instead of sear. Cook approximately 2 minutes per side or until nicely brown and cooked through. Remove from heat and keep warm. To make champagne sauce: To the skillet, add champagne, lemon juice and shallots, stirring to get every last bit of goodness from the pan. Bring to a boil and let reduce by half. Remove from heat and add butter, whisking constantly until well incorporated. Season to taste. To serve: Plate steak and scallops and drizzle sauce over the top. Serve immediately.